Meet the latest conference host in the Brussels circuit – it is no one else but Commissioner Margrethe Vestager. She made her entry into that market with a bang: Presenting a Nobel prize winner and other notable and notorious figures for free. Someone obviously learned the “think big and make it free” lesson from Silicon Valley… The conference about the future of competition policy was heavily overbooked, but Rupprecht Podszun was one of the 700 or so in the Charlemagne building. Here is his conference debriefing! Location: The Charlemagne building in Brussels. Huge. Airport-style-security, the difference being that instead of a grumpy security guy ever-smiling Kris Dekeyser, usually Director for Policy and Strategy in DG COMP, oversaw that things ran smoothly (and they did). Host: The Commissioner herself. It was the first conference during her mandate (and probably the last one, too), but you could not tell. Someone noted that she was present all day, sitting in the front row, listening intently. Not something you are necessarily used to with high profile politicians. She also mingled with the ordinary folks at coffee breaks. Audience: Many familiar faces, and many more I had never seen before. For instance, I spotted Philip Lowe, Jacques Steenbergen, Frank Montag, Isabelle da Silva, Birgit Krueger, Cristina Caffarra – oh, maybe you start identifying participants yourself on this photo, posted by the Commissioner! Okay, okay, I understand: It was the greatest show on earth. De-fi-nit-ely! 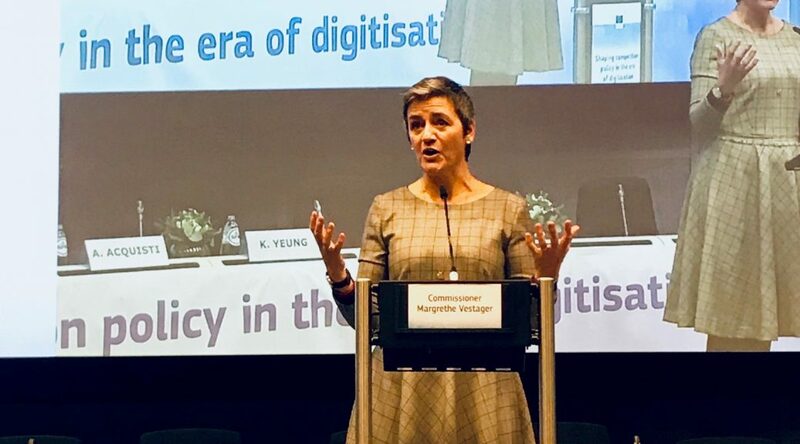 And Commissioner Margrethe Vestager set the tone in her introductory remarks when she appealed to our sense of responsibility for our children: “It is not for technology to shape our future – it is for us.” Digitisation changes everything, so what do we change in competition policy? I felt like being taken on a world-saving mission, somehow. But then, this is the Danish Commissioner, and she obviously is not for pathos-bathos. At the end of the day, it is her job to bring good cases and to win them at Court if necessary. And this is the fun thing about competition law: The cases echo all the discussions we have in society, from your personal Netflix addiction to your kids’ use of smartphones. Yet, while this is in the air, the cases are fought on the ground over economic expertise, evidentiary standards and the right understanding of the term “abuse”. Yes, that sounds like fun… may I take it that you were thrilled by the discussions on data, platforms and innovation in digital markets? Oh, you were a speaker! That’s how you actually got into that overbooked room! And getting in was not even the biggest privilege we enjoyed, but sitting on the podium gave speakers a pretty good overview of hierarchies in DG COMP. 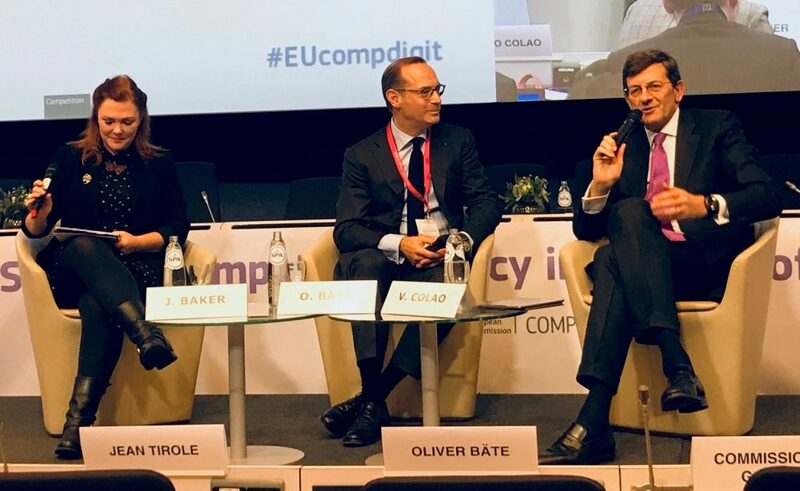 Front middle row: The Commissioner with her special guests Jean Tirole, Nobel Prize Winner, Allianz CEO Oliver Bäte, former Vodafone CEO Vittorio Colao and Commissioner Mariya Gabriel from DG CONNECT. Well, most of these people were on a fly-in-fly-out mission but for job-seeking Colao (“I’m using my time to follow interesting stuff and important stuff…”). 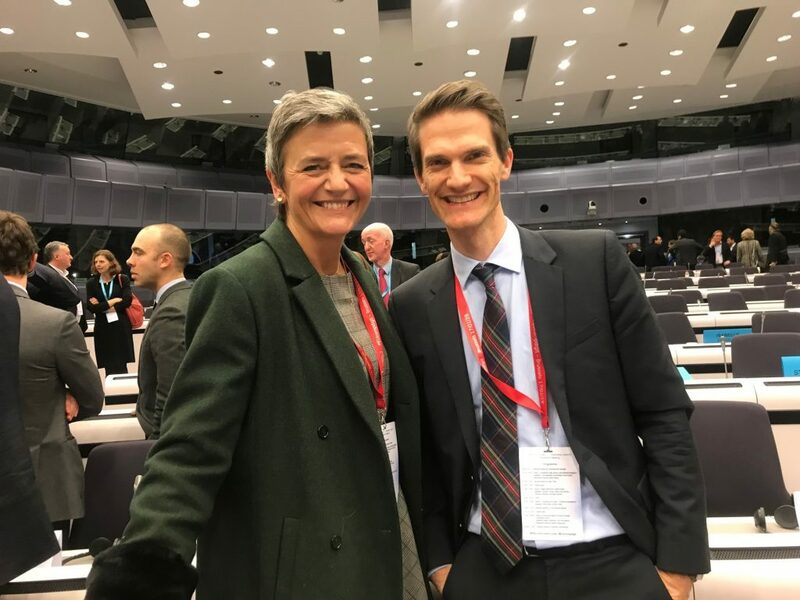 In the row behind Vestager, there were the people from her team, Wenzel Bulst, Linsey McCallum and Claes Bengtsson, and Chief Economist Tommaso Valletti. (No Chief Technologist at DG COMP yet! Hurry up, Bundeskartellamt!) 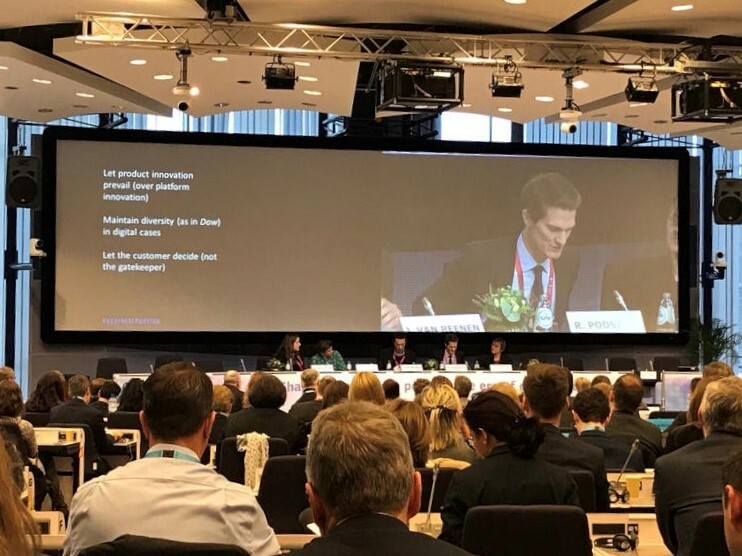 In the front row to her left you had Director General Johannes Laitenberger, Vestager’s head of Cabinet Ditte Juul-Jorensen and an impressive armada of DG COMP leaders such as Carles Esteva Mosso, Cecilio Madero, Nic Banasevic, Thomas Kramler and the like. On the other side of the nave, there were Vestager’s spokesman Ricardo Cardoso and the policy team with Maria Jaspers. Unfortunately, I had to give a talk, so I wasn’t able to absorb the picture in full, trying to understand the intricacies of DG COMP protocol! In your academic circles, a Nobel Prize Winner is probably the number one in protocol. Jean Tirole delivering his inspiring keynote. You know there is no Nobel Prize for law, and this Alfred Nobel is even reported to have hated lawyers due to his experiences with patent lawyers… But, yes, Jean Tirole was there, and he was the star speaker of the day. He won the “Sveriges Riksbank Prize in Economic Sciences in Memory of Alfred Nobel”, as is the official name, in 2014 for his work on market power and regulation. His works on multi-sided markets are cited in every article nowadays. His appearance was inspiring. A top-notch economist can rely on his “gut feelings” instead of formula, models or robust theories. This makes it easy to follow, even for a lawyer (but hard to translate into legal argument). Take the infamous “killer acquisitions” for instance. 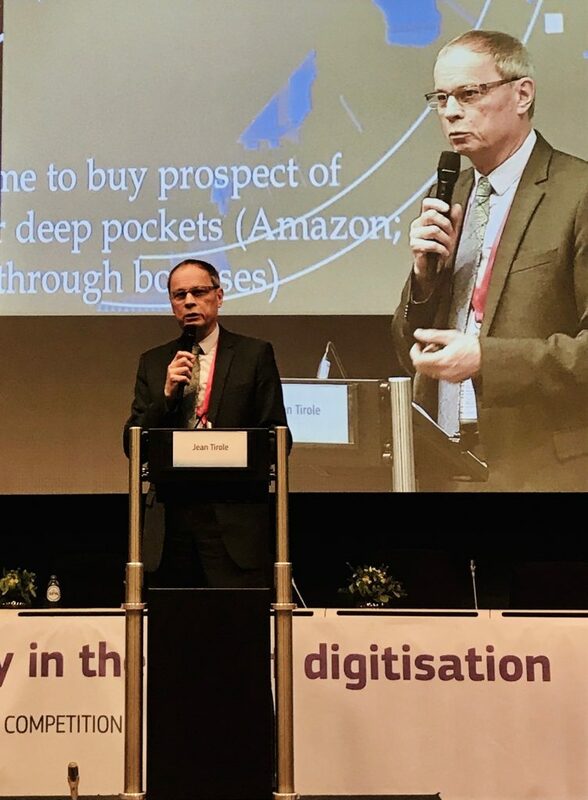 Tirole’s take: Facebook/WhatsApp and Facebook/Instagram made me very nervous – yet I am unable to prove it. Still, he suggested to consider to shift the burden of proof in such cases. Or breaking up monopolistic providers of digital infrastructure. Tirole: There is no viable proposal on the table, yet I am not against it as such. Honestly, a top economist considers breaking up Google? I never said that! He is “not against it as such”. Very cautious wording! But on the open-ended intervention scale, Tirole reaches higher amplitudes than your average Valley-sponsored mainstream economist. He’s French, after all. Tirole showed a table of the Top 20 Tech Firms in the world by market capitalisation, none of them being European. I guess you call that a “chilling effect” for all those in the room still dressed in the cuddly cloak of European industrial leadership. It took a couple of hours before MIT’s John Van Reenen questioned the concept of thinking of companies as “national”. Tirole took that chart to hammer home “8 recommendations if one is to engage in industrial policy” (again, note the cautious wording!). His suggestions were very smart and paved the way forward, in particular his idea of adaptive regulation instead of inalterable blocks of legislation as is the General Data Protection Regulation. You discussed the GDPR at a competition law conference? 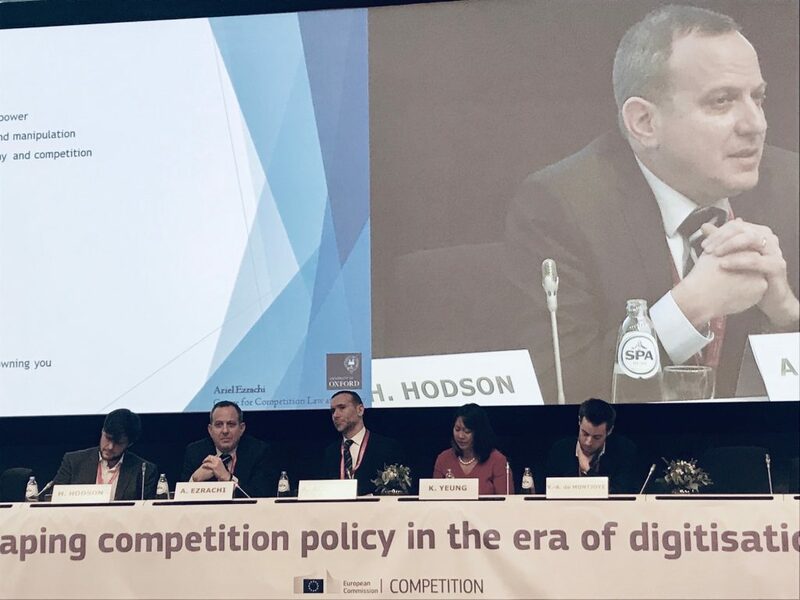 Yes, but this was a conference on competition policy, and it stood out by integrating perspectives that you do not get at your usual competition law conference. 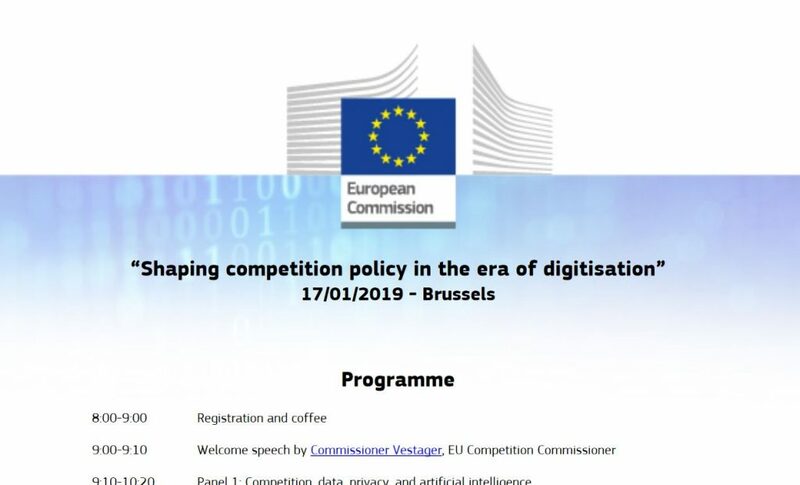 Take the first panel for instance: Ariel Ezrachi is of course a household name in such a conference: Co-author of the groundbreaking “Virtual Competition”, alerting us to the perils of data harvesting for competition. But he was joined on the panel by less frequent visitors in competition law venues, economist Alessandro Acquisti from Carnegie Mellon University and regulation theorist Karen Yeung from Birmingham University. Acquisti compellingly questioned the myths of data economics. Yeung introduced terms like democracy, human rights and rule of law, and as a benchmark for policy-making she even put forward the question: What is a good digital life? This sounds as if the advocates of the tech giants did not get much comfort at this conference. Hard to tell how they felt since they were not on the podium. The panel on platforms and their power gave them a particular hard time with Monique Goyens from BEUC, the European organisation of consumer associations, Sandeep Vaheesan from the Open Markets Institute that fired up the U.S. debate, and Fiona Scott Morton from Yale, who is a moderate, yet enforcement-friendly economist. While Goyens urged the audience to see more in the consumer than just an economic unit, i.e. integrating full-fledged consumer protection into competition policy, Vaheesan read out a pretty straight-forward attack against Amazon. Scott Morton called for focussing on entry as the key issue, advocating a strong take on MFN-clauses and exclusionary practices. Did the CEOs in their talk give big tech business some breathing time? When I take a look at the programme it was your panel on innovation next, and I am sure that you will most humbly point out that this was the highlight of the whole conference? Too much speed here. Before, we heard Commissioner Mariya Gabriel, who heads DG CONNECT, talking about digitisation and the society. For most people in the room, this meant brushing up your French, since Gabriel preferred to speak in French, and the audience preferred not to display any linguistic weakness by turning to the interpretation in English or German. And what a lovely French with a rolling Bulgarian Rrrrrrrrr! I also learned that the French still come up with their very own language. Remember your “ordinateur” (instead of “computer”) from your vocabulary book in school? Now, digitisation is “numérisation” in French, while it is “Digitalisierung” in German, “digitalização” in Portuguese or “digitalizzazione” in Italian. Apart from these linguistic issues her talk served as a reminder for the framing of the conference: One – we are discussing “how to shape the society of the future.” Two – there is an elephant in the room. The elephant in the room? I thought that was the one knitted by Margrethe Vestager when not scribbling down notes! Could you please leave those cheap jokes for me? But true, Vestager worked on a knitted elephant during the day. The real elephant in the room was regulation. DG CONNECT is in charge of the platform-to-business-regulation, a legislative piece that is on its way at present. Legislators not committed to competition alone currently battle for the right approach: Do we just want transparency from platforms? Or do we take one more step? Self-preferencing is an example. Should a platform only inform users that a product or service comes from a platform-owned company, or should there be an obligation not to favour this product in any way? Werner Stengg, head of unit in DG CONNECT and dealing with the P2B-framework, was sitting just three metres away from me. Commissioner Gabriel and Mr Stengg seem to be very likeable, yet for competition folks their presence included the message: If you do not get your act together, we may have to jump in. If the tech giants are not tamed by antitrust law, there will be regulation, a toll that may be tougher than a false positive under competition law. 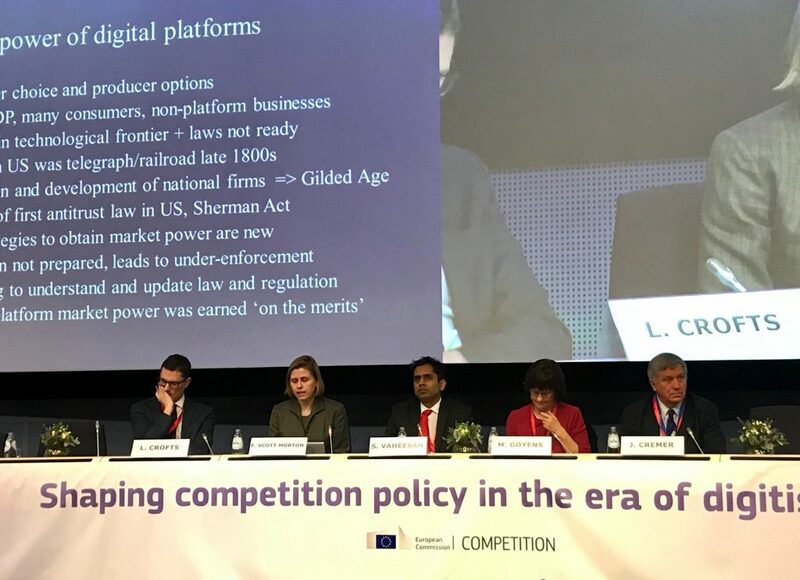 For some competition lawyers the two areas are strictly separate, yet many on the podium, Tirole for instance, do not seem to share our obsession with the border between competition law and regulation. In your panel, there were Mariana Mazzucato, John Van Reenen and you discussing innovation. Yepp. Why don’t you watch it? It is all on the web, e.g. our panel starts at 6:50 here. Van Reenen spoke about rising concentration in the U.S. and Europe in all industries. Mazzucato is another advocate of smart government intervention. She says that governments should not focus on fixing market failures only, but need to pursue a market shaping agenda and get their fair share out of the deal with the companies. What would Google be without the internet, what would Uber be without GPS, what would the iPhone be without a touch screen? All these were publicly funded inventions, and so Mazzucato implies, it is fair to “tax” (maybe even in the most literal sense, Vestager will have thought at this moment.) I cannot remember very much from what I said since I had to put my brain temporarily into the cooling pond afterwards. Come on, don’t be shy, your slides will not be helpful anyway. Well, I encouraged DG COMP to be innovative as well, not just asking companies to be innovative. And I encouraged them to risk more by doing more pioneering cases, but hedging this risk with some intelligent tools. For instance, I think that the institutional innovation economics approach in Dow/Dupont is worth to be tested in digital industries as well. I also tried to point out that we need to get the price competition bias out of our toolbox, e.g. the SSNIP-test. Regarding the diffusion of innovation I believe we should let the consumer decide, not the gatekeeper. Discussing innovation: If you take a closer look you see Bloomberg’s Natalia Drozdiak, Mariana Mazzucato, John Van Reenen, yours truly, and Special Adviser Heike Schweitzer. Lovely. So, that was it then? 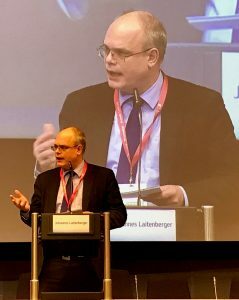 Director General Johannes Laitenberger: Guess what he watched as a boy! No, no, no, the best is yet to come! Johannes Laitenberger had the final words, the DG, and when he started (at 8:00) I thought that he was just doing some housekeeping: thanking everyone, telling us that there were more than 100 contributions before the conference (published here), that there is a Student Challenge and that there will be the report by the Special Advisors in spring, Jacques Crémer, Yves-Alexandre de Montjoye and Heike Schweitzer. These three chaired the panels by the way, giving very helpful introductions to each topic, before the moderators – Lewis Crofts, Hal Hodson and Natalia Drozdiak – took over. Laitenberger said more, however, including disclosure of a personal secret. Hadn’t you promised some insights into personal secrets? Oh yes! Laitenberger looked back into his youth: “When I was a boy my first exposure to economics was a TV series.” This caught many of us off guard because you do not expect the DG to indulge in sharing personal moments from his upbringing in Portugal. But then, this was a real Laitenberger. Guess what he watched when he was a boy! “Free to Choose” – a TV series where legendary Milton Friedman and his wife Rose explained the market economy. This is the stuff that DGs are made of. What would good old Milty have made of this conference then? Hard to tell. His son David styles himself as an anarcho-capitalist, and Milton himself was not known for being interventionist. So the general pro-enforcement stance of the day may not play well with the Friedmans. Yet, it was clear that intervention still needs some reflection on the tools, legal presumptions and economic findings. Do not expect big changes in competition law any time soon. But the scene is set for a more vigorous enforcement and a sharpened view for the role of platforms, data and innovation. And finally, the conference disproved Milton Friedman in at least one issue: There was such a thing as a free lunch.